PRESIDENT MICHAEL D Higgins has confirmed that he has accepted an invitation to address the United Nations in New York next week. Beginning his trip at the UN headquarters next Tuesday, Higgins will discuss the future role of Ireland’s commitment to peacebuilding and sustaining peace, and Ireland’s contribution to the UN. He will also address Ireland’s role in the negotiation and ratification process for the international Sustainable Development Goals and the Paris Agreement to address climate change. Higgins will be accompanied by his wife, Sabina Higgins, and Minister for Children Katherine Zappone. The following day, Higgins will have a special meeting with António Guterres, Secretary General of the United Nations. He will also meet with the President of the UN General Assembly, Miroslav Lajcák. That evening, Higgins and his wife will meet members of the Irish community in New York, after which they will visit the site of the new Irish Arts Centre, and attend a gala concert in support of the centre. Higgins is to address an event highlighting the achievements of Irish women in business, politics and philanthropy on Thursday. On Friday, the President will meet with invitees of Irish State agencies Enterprise Ireland, Tourism Ireland, IDA Ireland and Culture Ireland. He will then head to the New York Public Library and the Tenement Museum, which documents the lives of immigrants who lived in Manhattan in the 19th and 20th century. On the final day of his visit, Higgins will meet representatives of immigration and the community centres working in New York, followed by a visit to Rockland GAA, the largest GAA club outside Ireland. Email “President Michael D Higgins to address United Nations during US visit next week”. 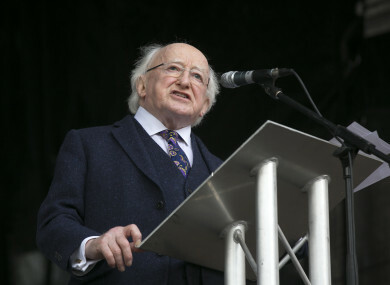 Feedback on “President Michael D Higgins to address United Nations during US visit next week”.